A new photography book combines religious kitsch, southern mythology, and eerie occult horror. 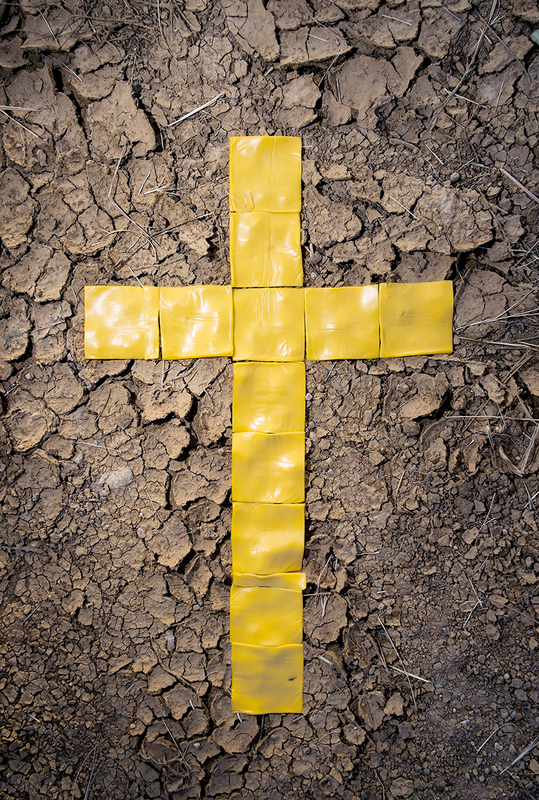 A crucifix made from Kraft cheese slices sitting on a dirt road. Poltergeist-y mist coming seeping through a sunlit door. Two bedsheet ghosts driving a car. These are just a few of the funny and strange photos included in Maury Gortemiller’s new book Do The Priest in Different Voices, a collection of images inspired by the photographers’ bible-heavy childhood memories. Growing up, religious illustrations helped him conjure the unseen and make the Bible’s written words – which felt abstract and inaccessible – feel tangible, palatable and worth contemplation. His work is a peculiar, contemporary take on these narratives, often infused with mythology from the American South where he grew up and currently lives and works. We spoke to discuss everything from the project’s origins to Gortemiller's relationship with religion and his love for horror movies. Amy Parrish’s Place I Slept is an ongoing series of photographs made while driving across the North American landscape. It’s a project countless photographers have made for more than a century, often as some kind of “rite of passage,” often by bro-tographers like Ansel Adams set to profess their freedom by claim the land with their cameras. Parrish’s work is different. It’s quieter, lonesome, and solitary. Places I Slept, is, as the title clearly suggests, a personal portrait of America as illustrated thru a constellation of beds, cars, and twilighted landscapes. Having moved back and forth from India some years ago, Parrish walks the line between native explorer and tourist, struggling with where she fits, the cultures she’s adapted to, and whether she feels like she can call this now unfamiliar terrain home. I spoke with Parrish to learn more. A new stock photography website champions white masculinity. Berger's photographs feel like instant punctum but there’s layers upon layers to absorb. If you’re active on Instagram, you’ve likely been struck by Kyle Berger, aka @kyyyyyyyyyyyyyyyyyyyyle’s instant-woah photos of owls, raccoons, eagles, fast food signs and other animals, people, and objects thrown jarringly into suburban landscapes. Golden arches loom ominously behind flash-blasted foliage. Flames smoke and engulf a lone black sedan on a thruway. A bear sneaks up on a smiling baby from behind a tree. In all of Berger’s photos, there’s something humorously off. They’re intentionally unreal – at once creepy and funny, throwing light jabs at the absurdity of contemporary suburbia and declining strip mall culture. Most of Berger's photos are digitally altered, but, like KangHee Kim aka @TinyCactus, Laura Hendricks aka @hav_house, and countless others, representing “truth” or having a photo “look real” is irrelevant. I spoke with Kyle to learn more. To celebrate her new representation of Micaiah Carter, acclaimed art advisor Sarah Hasted speaks with the photographer about his lyrical portraits of celebrities and everyday people. The first time I saw the photography of Brooklyn based artist Micaiah Carter in the fall of 2016 at Parsons School of Design, I knew he was going to be successful. A self described recluse, he was not social in college, he just put his head down and quietly got to work. Mentoring and guiding him through his senior year was one of the true joys of my long teaching career. The unique gift that 30 years of experience in the art world and 16 years teaching at one of the most prestigious art schools in the world has given me, is the ability to spot artistic talent and potential – immediately. The work is soft hued with a 1970’s tone and vibe that pay homage to his family history and father’s scrapbook. In some works, Micaiah consciously references his father’s early life and dated fashion and with total reverence, creates exquisite, inspired images, that can only be interpreted as stunning.